“Avalanche” comes with a clean HTML5 code and SEO enriched design that would positively impact your search rankings. The theme is flexible and comes with a separate options panel within the main admin panel where you can customize your design elements. It can be used for any online storefront and also includes an embedded contact form and social media icons. The theme is built on the latest HTML5 & CSS3 standards and supports Magento version 1.5 and higher. The homepage comes with attractive jQuery effects for your icons along with a support for a custom banner, favicon and logo. You also get to choose from 25 customizable background patterns and 7 basic color options. Extensive typographic options of over 400 different fonts give you a wide choice in your content styling. The homepage features a prominent keyword search bar in the header which allows users to easily do a quick search. Also included is an international flag and currency switcher along with an opt-in box in the footer for newsletter subscription. The primary content area has a full-width image slider along with 3 call to action spaces for your banners. The rest of the content area has a 5 column grid which can be used for different product categories. All product listings come with an Ajax enriched “Quick View” option that loads a snapshot of the product along with an “Add to cart” facility. The theme has a top menu for basic account management and support quicklinks along with a shopping cart icon with a touch menu. Primary navigation is by a Megamenu which can include multiple columns of categories along with embedded images. You can also choose from a “Suckerfish” or “Simple menu” options. The theme also has a separate footer quicklink menu along with breadcrumb filters for internal pages. Internal category and search result pages comes with a choice of a grid or list layout along with an option to sort by “Position”, “Price” and “Name” attributes. You can also add sortable categories in the sidebar such as a price range etc for easy access. Individual product pages come with “Cloud Zoom” facility that allows users to see a magnified version of the image highlighted by the mouse pointer. You can also include social media icons, reviews and star ratings and can also allow users to add the product to a wishlist or for comparison. The checkout module comes in a user-friendly single page format with a option to redeem a discount coupon and also allows users to check the shipping and tax estimate based on their location details. 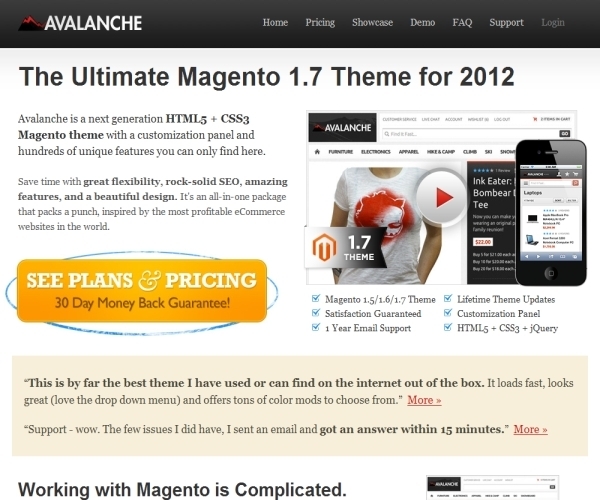 The Avalanche Magento Theme comes with life-time free updates and one-year free support. It’s priced at $199 for the premium edition and $399 for the developer edition for unlimited usage.